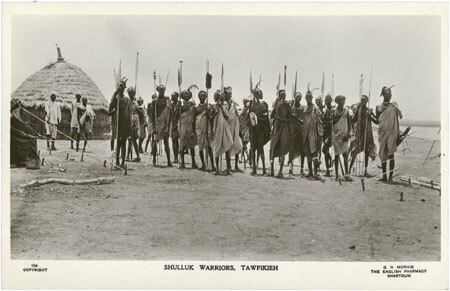 A postcard group portrait of Shilluk men holding large spears, feather plumes in their hair, a tent pitched to right of frame. Notes on postcard - "104 Copyright. G.N. Morhig, The English Pharmacy, Khartoum. Shulluk Warriors, Tawfikieh"
Morton, Chris. "Group of Shilluk men" Southern Sudan Project (in development). 03 Jan. 2006. Pitt Rivers Museum. <http://southernsudan.prm.ox.ac.uk/details/1998.88.39/>.